So far this year Id resisted plant catalogs. But this one got me unfairly. A front-page headline read Time to Move On and I panicked: oh, no  is Darrell Probst going out of business? So I read the whole article, and no, he was mourning the end of a business arrangement for importing newfound epimediums from China. These long-lived shade perennials, native from the Mediterranean to China and Japan, deserve more attention than they get in garden centers. Their flowers are delicate, not showy  but worth noticing: the common names bishops hat and fairy wings refer to their odd shapes, often with spurs making fantastic arches. Colors range from yellows through salmon and all kinds of pink, to purples and white. In addition, flower parts often contrast in color  for example  Court Jester has light yellow spurs and a large cup, backed by shorter, medium pink inner sepals. The leaves, usually rather small, make a rich textural effect that contrasts well with other plants. For many weeks in spring most species show red, maroon or chocolate variegation; many color nicely again in the fall. Some are evergreen. Leaf heights range from four inches to four feet. Tough, easy-care plants, they can grow in the same spot for 40 years without dividing. Most form slow-growing clumps; some spread slightly more quickly, making good ground covers. Theyre seldom bothered by pests, and not a favorite of deer. Once established, they tolerate drought. Probst, a world-renowned expert on the genus, has grown them since 1987; in 1996 he started hunting for them in China  both by traveling himself, and through financing expeditions by Chinese naturalists who mail him samples. He says he can fund four of those for the cost of one trip he makes  and besides, he likes to see his Chinese colleagues get professional recognition. Satisfying Chinese red tape used to be the main bottleneck. But recently, US Customs has bogged down in processing plant materials  to the extent that most die. Frustrated by losing so much, Probsts Chinese partner quit. So now Probst is focusing more on another side of his epimedium work: breeding superior cultivars  at Garden Vision, the nursery he operates in Hubbardston with his wife Karen Probst. The Epimedium Page - many, many great photos by Darrell Probst from his collection at Garden Vision. This is not a catalog  there isn't even any text here besides the names of the plants. Plants Delights Nurserys epimedium collection - they have 14 varieties, many from Probst. Online ordering (some varieties only available on the Web). Naylor Creek Nursery's epimediums - they have 55, online ordering, prices slightly higher than at Garden Vision, $35 minimum. Plant Hunting in China with Darrell Probst, by Jennifer Brown, on the site of Fine Gardening magazine. 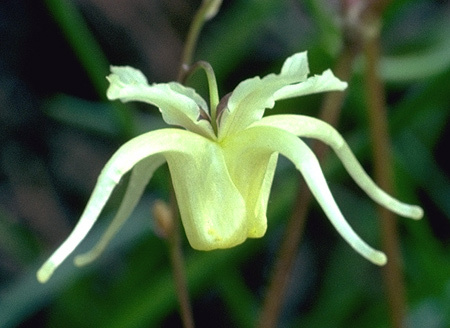 The Genus Epimedium by William T. Stearn 2002, Timber Press. Probst recommends this book. Also includes other herbaceous Berberidaceae, including the genus Podophyllum.